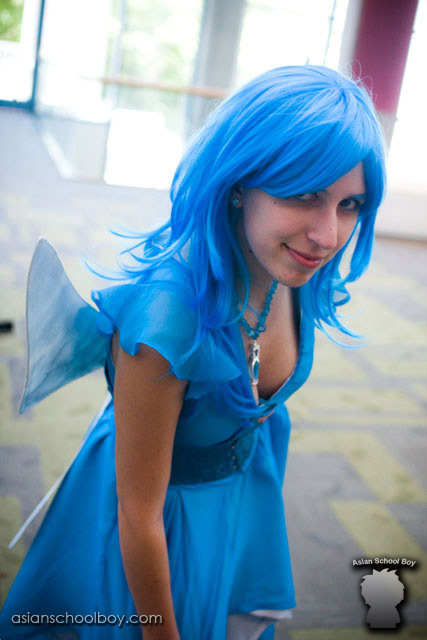 I only wore this to FanimeCon 2009 and I didn't win any prizes or anything (I didn't submit it it into any contests so I couldn't win xD). As for construction, I took two patterns and fused them together to make the dress. The top portion was taken from a shirt pattern and the bottom was taken from a fairy dress pattern. 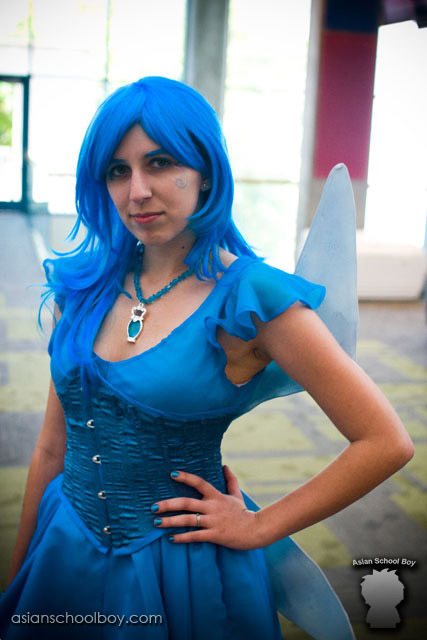 I used a light blue sparkly fabric underneath with a see-through aqua fabric on top to get the right blue to match my wig. The corset was made with a really nice brocade, but unfortunately it broke at the end of the day. It was the first corset I made, and that pattern was meant to be made with extremely heavy material to function like a true corset. The wings were made with shaped coat hangers that I then covered with pantyhose, coated with a mixture of glue and water to harden, then painted. I attached elastic to the back and fed the elastic loop through the lacing in my corset. It was kind of complicated to put on. I also made the necklace and bracelet. 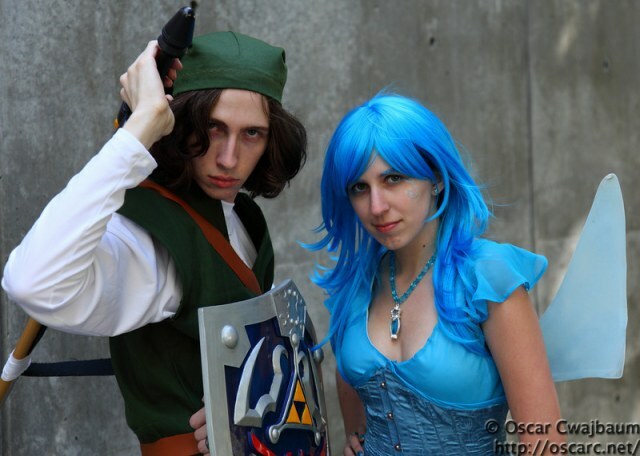 A friend found the blue bottle pendant and we thought it would be fitting, seeing as how fairies and bottles go together in Zelda games and it was the perfect color, too. 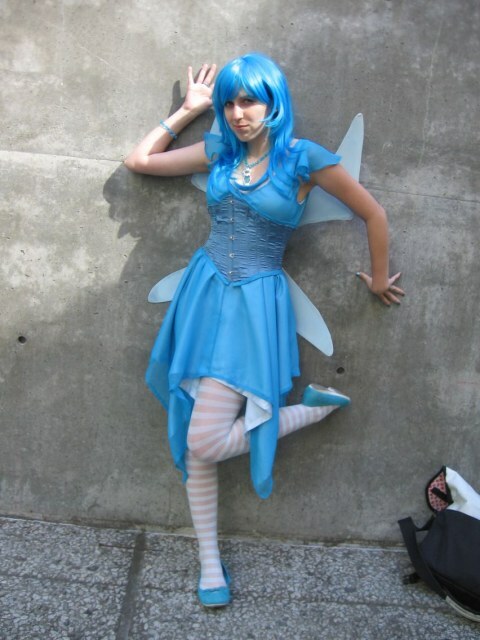 I pretty much made it up as I went along, which made things a bit easier than most cosplays. If I couldn't quite find something I had in mind, I could change it, since it was a design I made up. 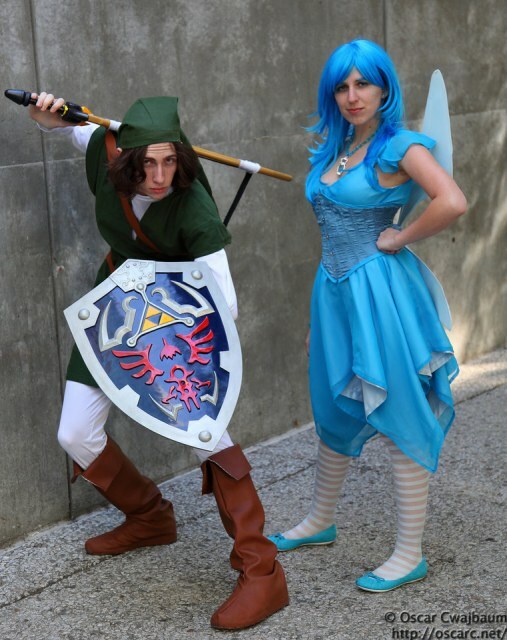 My boyfriend was going to be Link and I knew I just couldn't pull of Princess Zelda and he joked about me going around as Navi but then i thought it would be awesome if I could come up with a human design for her. I had come up with something more elaborate at first, but I'm glad it came out more simple. I think it's more fitting. And surprisingly, even when I was walking around by myself, people knew who I was! NEW! I Will Save Hyrule Myself!